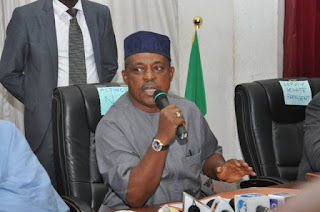 The Peoples Democratic Party, PDP’s Presidential Campaign Organization (PPCO) has urged all Nigerians to vote out the All Progressives Congress,APC-led government in 2019 in order to build a united, prosperous and peaceful Nigeria. The Director, Media and Publicity of the the PPCO, Mr. Kola Ologbondiyan said in a statement on Monday that Nigerians should use the occasion of Christmas to pray against poverty and hunger in the land. where our collective patrimony is only accessed by a cabal in the Presidency and corrupt APC leaders. “Nigerians should therefore, celebrate this year’s Christmas, focusing on the brighter future that awaits our nation under Atiku Abubakar as the next President and not on the pessimism and promise of more suffering by President Buhari. “In this regard, the PPCO urges Nigerians to use the occasion to show love and share with compatriots in anticipation of a brighter future,” the campaign organisation said.